An invite code is a unique series of letters and numbers that Admins give supporters to let them instantly join their campaign. Admins can generate, delete, or review invite codes by going to the Admin Dashboard and clicking on Manage Invite Codes. Every code that is generated will allow up to 100 people to join your campaign. If your code has hit its expiration date, it will be known as “Expired”. Once it has run out of available slots, it will be known as “Depleted”. These expired and depleted codes will be displayed in separate sections (as exemplified on the screenshot below), but they will not be usable for actually joining your campaign. Any invite code in any state (active, expired, or depleted) can be deleted using the red trash icon in its row. From the Manage Invite Codes screen, tap the “Generate Invite Code” button in the top right to open up a Code Generator dialog box. This box will ask you to name your invite code (try naming it based on how it will be used or who it will be given to) and an expiration date/time for the code. 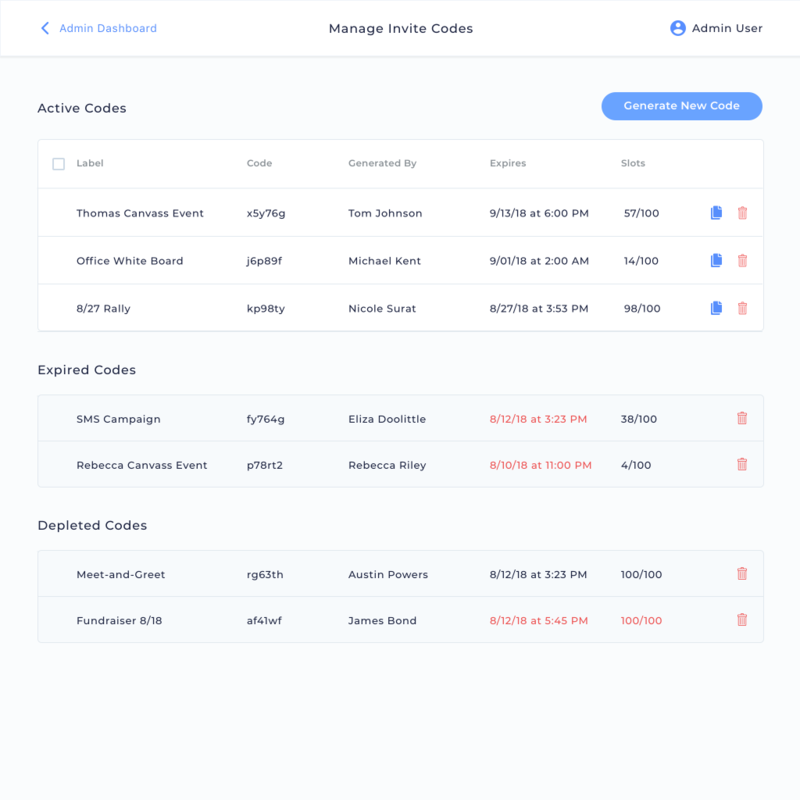 Use this screen to generate and manage invite codes. These codes allow Reach users to join your campaign without an individual invitation. From their campaign picker, they can merely enter an invite code and they will magically be able to Reach for your campaign. Be cautious and aware of where you share invite codes because anyone in possession of a code will be able to use them, unless you have deleted the code, it’s expired, or it’s depleted. You can always remove a user (see the “Manage Users” article), but you’ll be much better off if your invite code is only shared with trusted friends of your campaign.